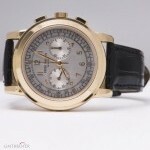 Case material: Yellow gold; Charge: Automatic; Conditions: Never worn Presentation condition : With dealer guarantee ; Place: Usa, Boca Raton Model: Complications Annual Calendar Price on request Jewels in Time Reference: 5146J-001 Brand: Patek Philippe Model: Complicated Annual Calendar Reference: 5146J-001 Case: 18k Yellow gold Size: 39mm (not including crown or lugs) Dial: Creme dial with annual calendar and moonphase features. 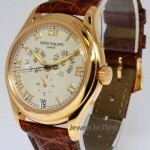 Date at 6:00 Attachment: Patek 18k yellow gold deployant buckle Movement: Automatic Box/Papers: Box and papers. Comes with our JIT 2 year warranty. 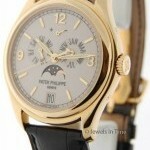 Notes: Mint preowned mens Patek Philippe mens complicated annual calendar in 18k yellow gold comes with its box and papers and stylus. Retail: $39,400. 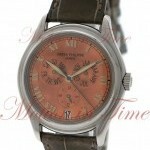 Case material: Rose gold; Charge: Automatic; Conditions: New Presentation condition : With dealer guarantee ; Place: Usa, Boca Raton Model: Complications Annual Calendar Price on request Jewels in Time Reference: 5035R Brand: Patek Philippe Model: Annual Calendar Reference: 5035R Case: 18k rose gold with transparent back Size: 36mm Dial: Beige with rose romans Attachment: Brown exotic stitched strap with Patek 18k rose gold deployant buckle Movement: Automatic Box/Papers: Patek box and Archival document. Comes with our JIT 2 year warranty. 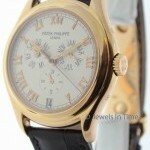 Notes: Pristine preowned mens Patek Philippe 5035R in solid rose gold comes with its Patek shipping box and Archival Document as shown. 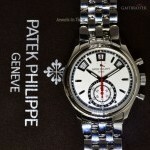 Case material: Steel; Charge: Automatic; Conditions: New Presentation condition : Without documents; Place: Usa, Boca Raton Model: Complications Annual Calendar Price on request Jewels in Time Reference: 5960/1A-001 New Patek Philippe mens Annual Calendar Chronograph in stainless steel on bracelet. Comes with its box and papers and hang tag as shown. Retail: $51,000. 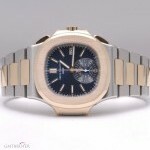 Case material: Platinum; Charge: Automatic; Conditions: Excellent + Presentation condition : With dealer guarantee ; Place: Usa, New York Model: Complications Annual Calendar Price on request Giulio Bonaccio OROLOGIOINC NYC Reference: 5960P patek philippe 5960 p blue dial chrono and annual calendar MINT conditions ;COMES WITH BOXES AND BOOKLETS AND PUSHER ;DISCONTINUED ;PRICES ARE ;THE BEST PRICES AROUND ;SUPER GREAT DEAL AND FIRM PLEASE ;AND ARE INCLUDING SHIPPING IN THE US ;FOR INTERNATIONAL PLEASE ADD 100 TO 150 USD MORE ;AS TRADE I DO TRADE WITH OTHER PAMS ;IF U HAVE A SPECIAL EDITION PAM ONLY PLEASE ;OTHERWISE STRAIGHT SALE ONLY ;Please email me for more scans ;Tons of References Worldwide ;for your piece of mind and worry free Transaction ;i accept as payment ;Bank wire;ALSO local pk up;in NYC MANHATTAN ALL THE WATCHES POSTED ARE AVAILABLE TO VIEW OR TRY ON ;AT OROLOGIO INC. MADISON AVENUE ;NY NY 10017 ;Tel.212 354 8402 ;MONDAT TO FRIDAY 9 AM TIL 5 PM ;SATURDAY 1 PM TIL 5 PM ;PLEASE CALL FOR APPOINTMENT,THANKS With All My Best Regards Giulio ;GBONACCIO@GMAIL.COM ;Orologio Inc is not an authorized dealer for any of the watch brands it sells, non affiliated with any of these companies. All brands are registered trademarks of their respective owners ;i`m a collector and i buy ,trade and sell only pre owned watches ;ALL THE WATCHES THAT I SELL INCLUDING ONE YEAR WARRANTY WITH MY STORE. 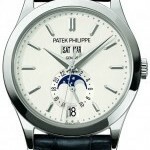 Case material: Platinum; Charge: Automatic; Conditions: Used Presentation condition : Without documents; Place: Usa, Boca Raton Model: Complications Annual Calendar Price on request Jewels in Time Reference: 5960P Pristine preowned(6 months) Patek Philippe mens 5960P platinum Annual Calendar Chronograph watch features a rare blue dial. Diamond (shown) indicates a platinum case. 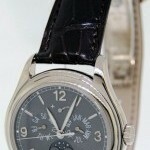 PP navy blue strap with PP platinum deployant buckle. 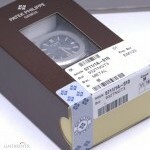 This watch is 6 months of age but unfortunately the papers were misplaced and so it comes with its box and stylus only. 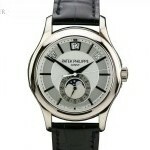 Case material: White gold; Charge: Automatic; Conditions: Never worn Presentation condition : With dealer guarantee ; Place: Usa, Boca Raton Model: Complications Annual Calendar Price on request Jewels in Time Reference: 5146G-001 Brand: Patek Philippe Model: Complicated Annual Calendar Reference: 5146G-001 Case: 18k white gold Size: 39mm (not including crown or lugs) Dial: Grey dial with annual calendar and moonphase features. 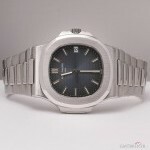 Date at 6:00, and subseconds at 9:00 Attachment: Patek black exotic strap with Patek 18k white gold deployant buckle Movement: Automatic Box/Papers: Box only. Comes with our JIT 2 year warranty. 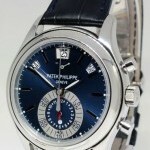 Notes: Mint preowned mens Patek Philippe mens complicated annual calendar comes with its box set as shown. 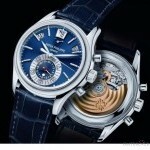 Retail: $44,400.